As you may know, I currently have a chain link fence running along the south side of my yard. To help hide the ugliness of the chain link, I covered it with reed fencing a couple years ago. Even though the reed fencing has made it more tolerable, I have a garden tour coming through this year and feel this is the one thing that makes my garden not worthy of the tour. Because of this, I’m seriously considering replacing the chain link fence with something similar to the composting fence below. 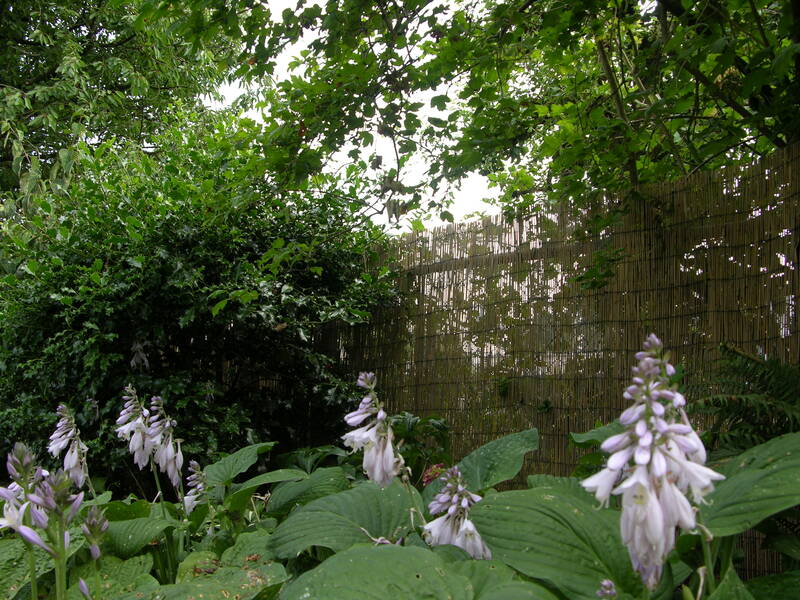 It’s an affordable solution to our fence problem with the benefit of eventually composting into the garden. Because I’m wavering a little, I’d like to hear what your thoughts are on this kind of fencing. Personally, I think it would be a great addition to our garden and what I’m trying to do with it (free range chickens, veggie garden, bog garden, natural habitat, etc). Do you think I’m crazy? 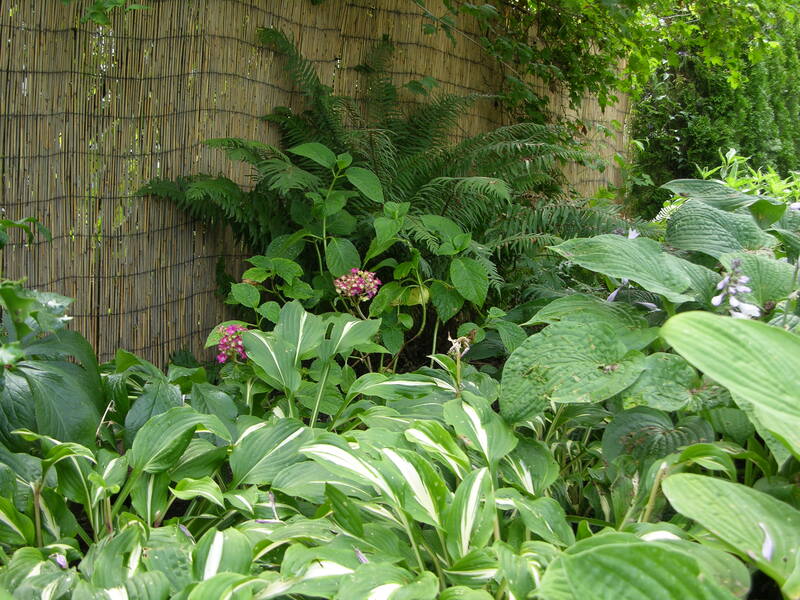 Here are some snapshots of the garden and reed fencing from this summer. I’m proposing that we replace anything covered with the reed fencing with a 4′ composting fence with arbor. I haven’t actually tried the compost fence myself, but it seems like it would work as long as the bulk of your composted items are suited for it. 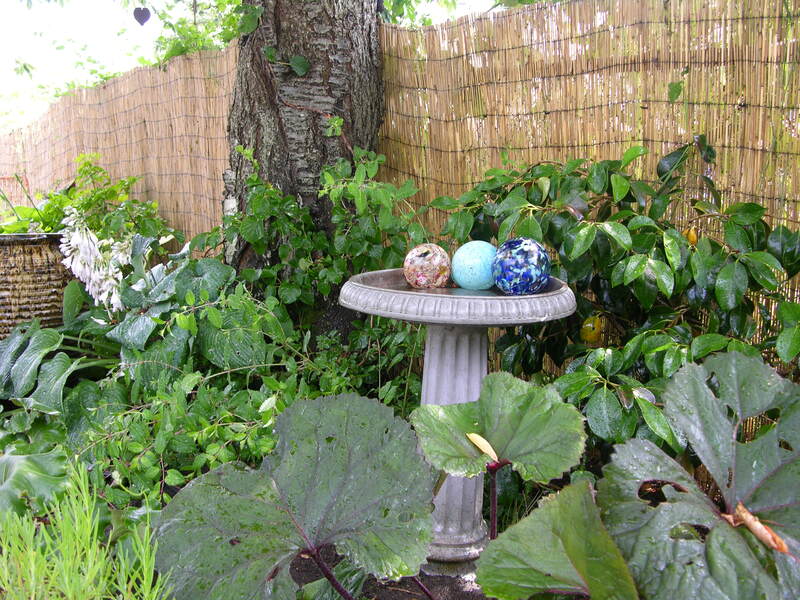 It may take some time to get the fence “filled” enough, but it seems like if you have the bulk to fill it from your yard, or the necessary means to get the bulk from elsewhere, it would be a great visual texture and conversation piece as well as a benefit to your garden. Have you ever looked at wattle fencing? I built a wattle fence at my old house but instead of using willow branches (or something comparable) I used tall grasses, weeds (before they went to seed) and other readily found natural materials from around the farm. The result was a very organic and pleasing brown backdrop for my mixed flower/veggie garden and because the shape was built using vertical sticks I’d dug into the ground, it was simple to install and versatile as far as the design. I used it to soften an otherwise very harsh, bare yard in front of the house. Thanks for sharing your blog. I honestly can’t remember how I stumbled across it. I think twitter suggested it after I started following Chiot’s Run maybe… Anyway, it’s great to peruse! Wow! I’ve never heard of such a thing nor has it ever occurred to me, but I love it! 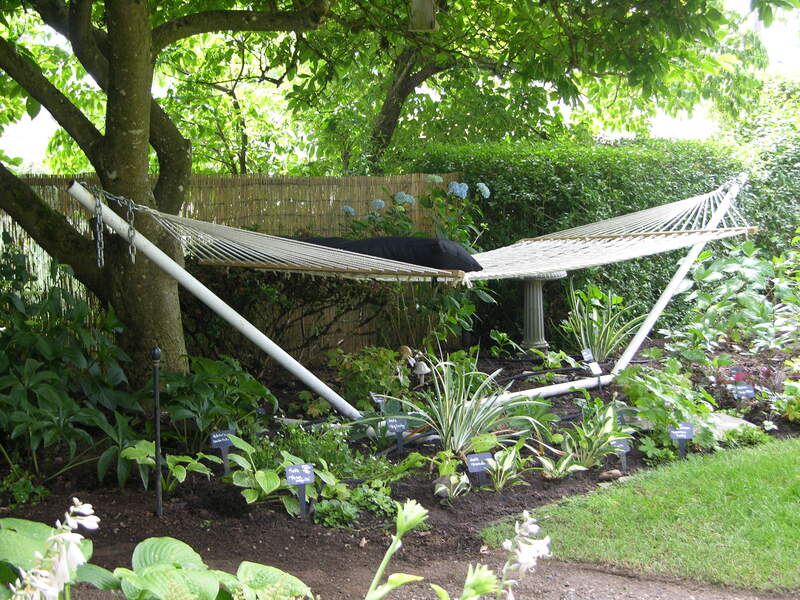 I love that is serves several terrific purposes at once, and that it would provide a natural backdrop to your garden. Here are my questions: how much material would you need to fill it, and how quickly would you be able to do so? As the materials compress / deflate (whatever the heck they do!) would it difficult for you to get at to keep adding more? I don’t think the reed fencing looks bad, so if the project is too time consuming or intensive, I think you’re in good shape with what you’ve got. If you wanted to cover some of the reed fence as an alternative, is there a way to attach a few bird houses here and there or maybe even some sort of hanging pot or attach a grow bag of some sort to the fence that could house something lovely that likes to cascade or sprawl? I would be curious to know how long your reed fence has been up and how it has held up in the elements…as well as a source or brand if you have a suggestion. We are thinking of getting some rolled reed or bamboo fencing to put along our chain link fence as well, and I’ve heard people complain about them rotting quickly. What a great site – I look forward to seeing how your garden grows this summer! Very interesting. I have not heard of this. I am always looking for chain link alternatives as I have the same problem. I think the reed fencing is a great improvement and I will be doing the same along our entire property line only on the other side of the chain link because my grape vines and virginia creeper are really growing well along the chain link and I love the vines.